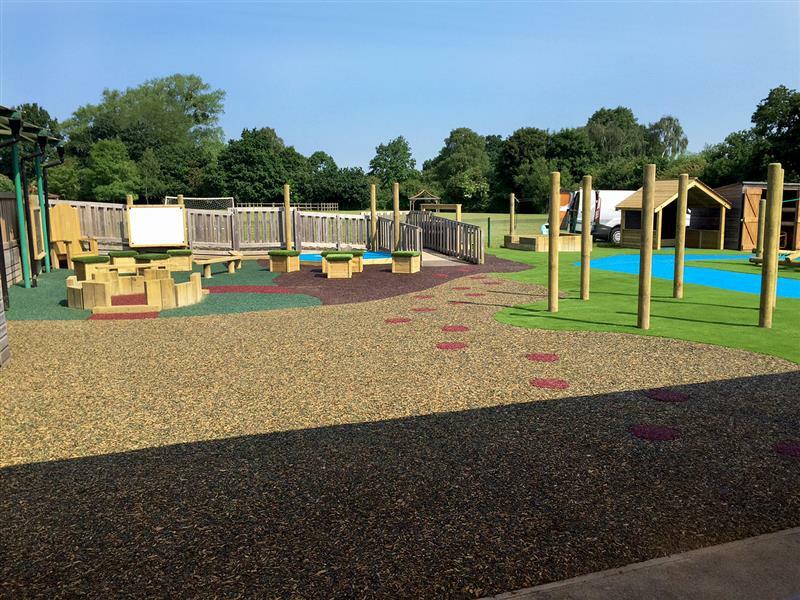 It was our South West Learning Consultant James Collis-Pritchard who met with Emmer Green’s Headteacher, Miss Tonia Crossman, to discuss further developing their outdoor learning environment. The space they had lacked resources that would inspire their children to engage in both outdoor learning and play activities. 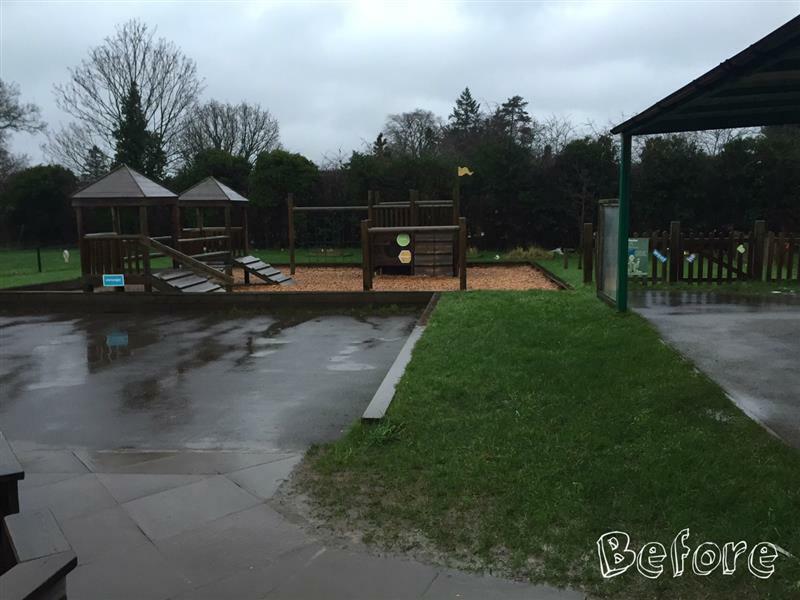 The playground had many grassed areas which became unusable and waterlogged during wet weather conditions. 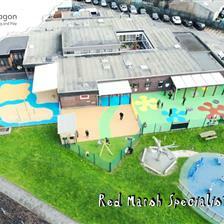 This also raised safety concerns as it created a potential slip hazard when the children were playing. 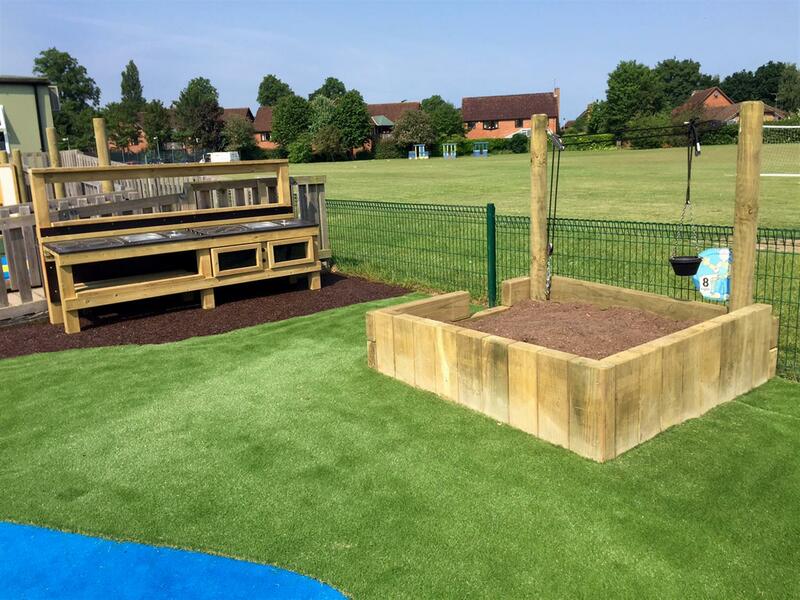 As well as eradicating the bad ground conditions, James and Tonia worked together to improve the range of open-ended and sensory play opportunities as well as resources for investigative learning. It was time to give Emma Green an environment that would create scenarios, games and activities for the children to self-select from, giving them the freedom to fully express themselves and build confidence when creating & discussing ideas with each other. 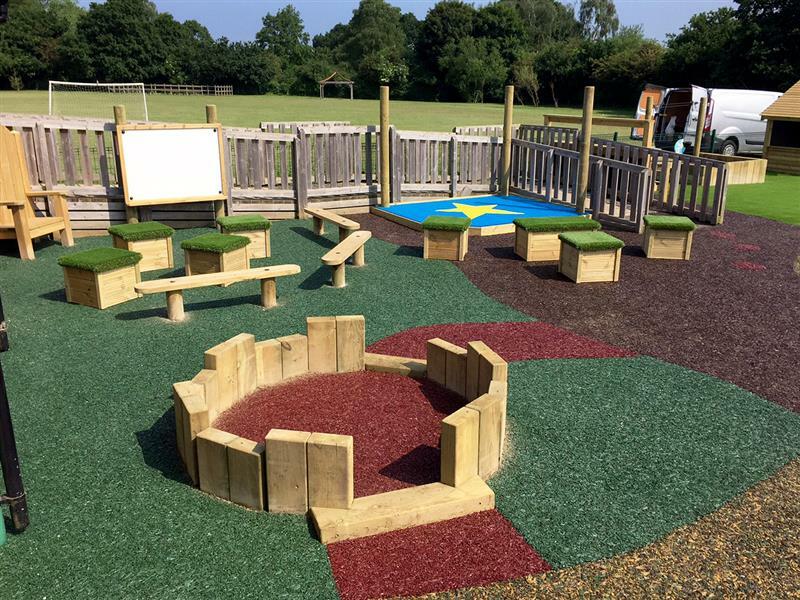 To help with this, we formed a ‘creative corner’ full of fun, inclusive and engaging playground resources over the top of visually pleasing and colourful Playbond surfacing. Children can now take part in storytelling activities with the addition of our Story Telling Chair and Seating Arrangement as well as having a Whiteboard and Chalkboard to become artistic on. They have a Performance Stage for character building and drama based activities and with the inclusion of Den Posts, they can now create dens together and transform the stage into anything that they want. The corner also includes our Small World Seating Circle to help build children’s confidence and social interaction during group discussions and general chat about the world around them. 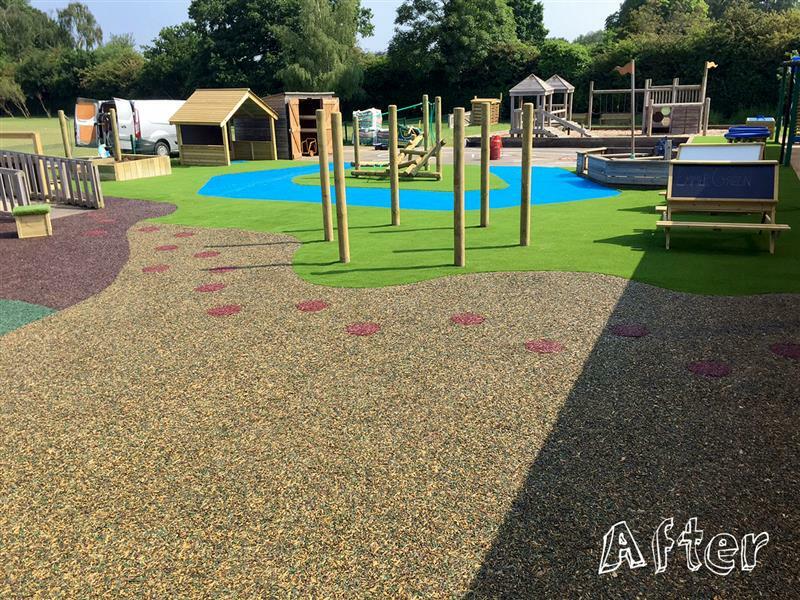 The bespoke Playbond design makes the area brighter and more attractive which will encourage more play and learning outdoors whilst reducing incidents within the playground due to its impact absorbing material. The different surface colours help zone areas of play and learning perfectly. 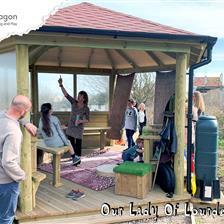 The creative corner can even be used to great effect by teachers during outdoor lesson time. QUICK we need some more Mud to make dessert!! A great way to stimulate children’s mind and senses is to offer resources that promote messy styles of play and learning, so we decided to create two separate zones for messy play. One zone was focused around getting muddy through play and involved our Mud Kitchen, Rope & Pulley and Dig Pit. Children can now work in teams to collect mud from the Dig Pit, pass it down the Rope and Pulley system and re-stock the Mud Kitchen when it is running low… how are we looking with those mud pies? The second messy play zone focused on the wonders of water and includes both our Water Wall and Water Table. These two resources are fantastic for investigative learning and link perfectly into the science and maths curriculum. For instance, Children will be able to estimate volumes in different plastics containers at the Water Table while children playing on the Water Wall will learn about aspects surrounding flow and gravity (a fun activity to teach children about this subject is to place a set of small rubber ducks at the top off the Water Wall and create a small race to the bottom). 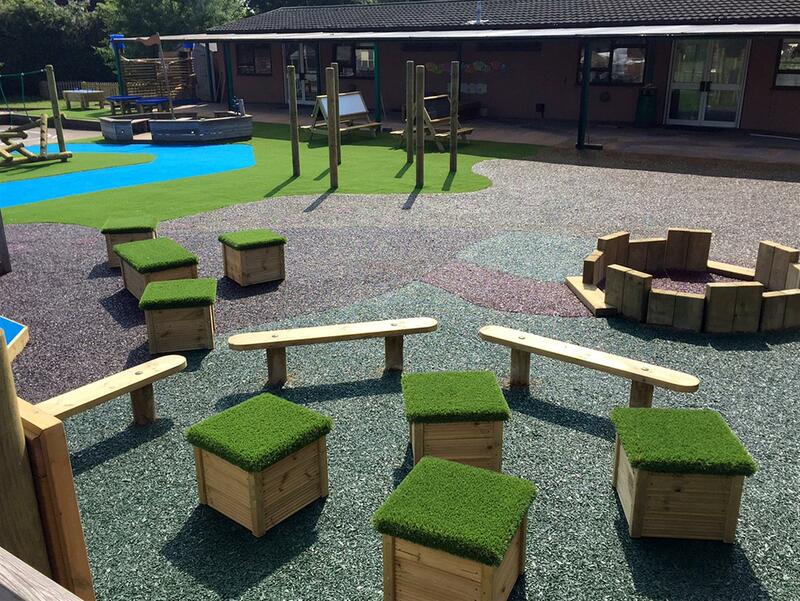 Our beautiful artificial grass Playturf was used to surface both areas and really gives them an inviting feel. Giant Playhouse with Walls & Chalkboard - children can now take part in role play activities and transform the Playhouse into anything they like as they self-select from their own pretend play games and decide how to learn. The addition of the seating and chalkboard offers the opportunity for outdoor lesson to take place. Additional Den Posts - with the addition of some materials and sheets, children will begin to create their basic den. 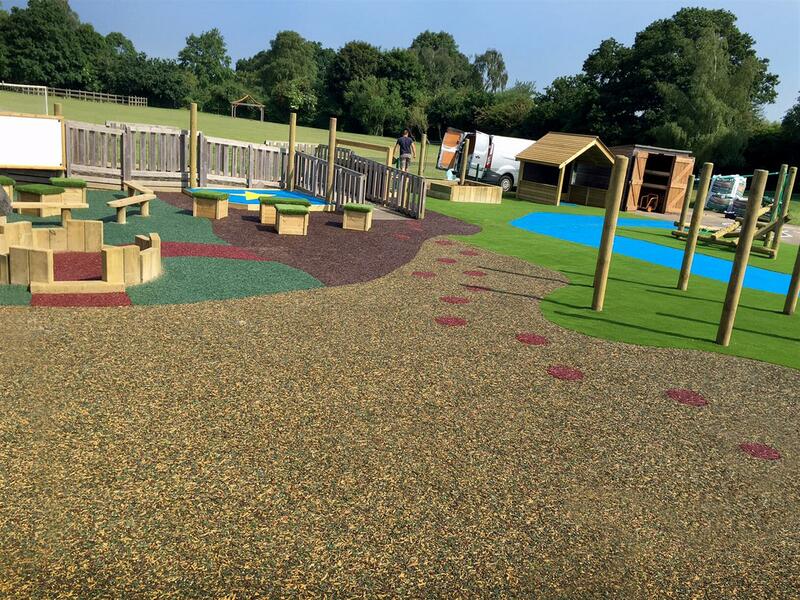 From here allow the children to be at the drive of the decision making, the creative possibilities will be endless when the children are involved in unstructured play. Today you could be entering a Hospital, Vets, Airport, School or Shop. 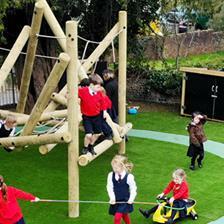 For physical development, we installed our Kinder Scout Climber. This low level challenge will offer the children at Emmer Green an easy accessible climbing challenge which will build their climbing confidence for when they move onto larger more advanced equipment. The Kinder Climber will also help develop children’s upper/lower body strength and the movement of their gross motor skills. 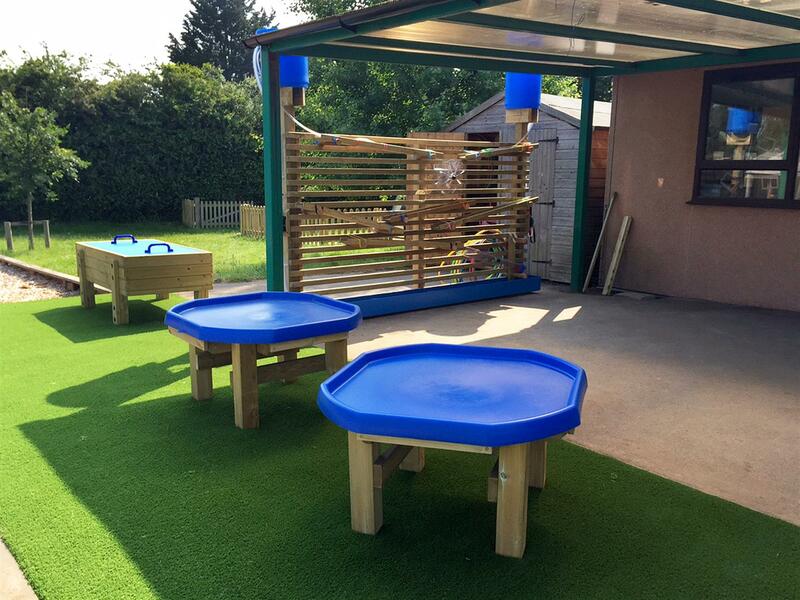 The Playframe has been added onto Artificial Grass and is surrounded by Blue Wetpour to create a fantastic zone for creative and imaginative play activities as well as safe risk-taking… can the children work together to escape Treasure Island?!! 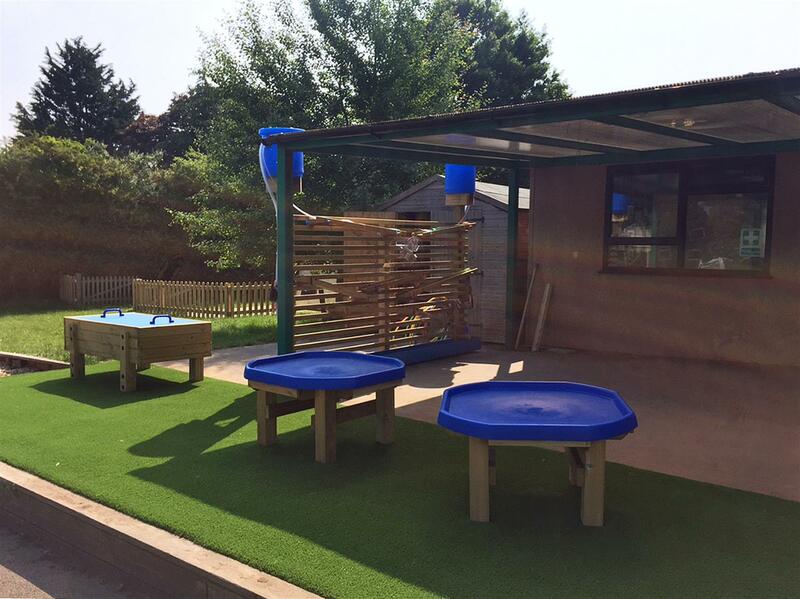 If you are interested in developing your early years outdoor learning environment and need a company with correct expertise, do not hesitate to Contact Us through the website or call us to speak to one of our specialist consultants on the chosen numbers – 01625 890 330 (North Office) or 0117 379 0899 (South Office).